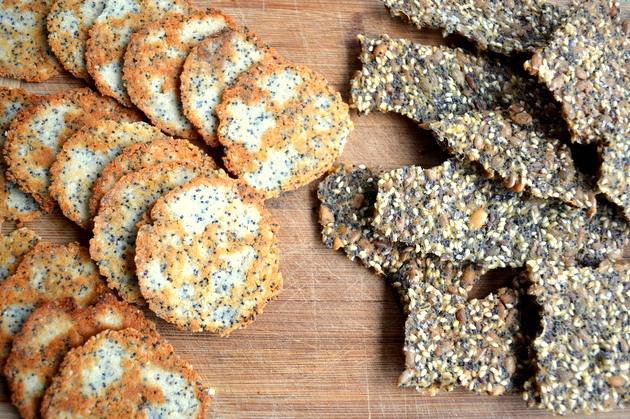 Pictured above on the right hand side of the breadboard, these thin bread seed crackers are likely to become a staple in your pantry once you try them. My good friend and chef extraordinaire, Miche Genest, features versions of this delectable thin bread in both of her recently published cookbooks; The Boreal Gourmet and The Boreal Feast. I’ve added poppy seeds to Miche’s list of ingredients because they are a particular favourite of mine. You can easily substitute seeds and spices of choice to customize these tasty crackers for your own table! 1 C corn flour Note that the texture is floury; not grainy like corn meal. Combine canola oil and boiling water and then add this mixture to the dry ingredients – mix thoroughly. The dough will be quite runny at first, thickening as the corn flour absorbs the water. Using a spatula, spread as thinly and evenly as you can onto the parchment paper lined baking tray. Don’t worry if there are small gaps in the dough. Cover the dough in the pan with another piece of parchment paper that has been lightly sprayed with cooking oil (pam). Using a rolling pin over the parchment paper flatten the dough as much as possible inside the pan. Remove the top piece of parchment paper and sprinkle the flatbread evenly with the Kosher salt. Place on the middle rack of the preheated oven and bake for 1 hour. Turn the oven off, prop the door open and leave the bread in the cooling oven for 20 minutes. Remove from oven and cool on a baking tray. When at room temperature, break the bread into large pieces. Store in an airtight container. The thin bread seed crackers will keep for several days. Makes about 45, 2″ x 3″ pieces.